Both Do328 variants were big sellers in the USA. 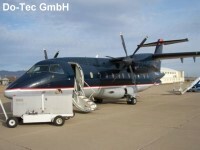 Their reliability, relative low maintenance cost and high comfort helped the Turboprop and the Jet to several fleet successes at the East Coast and the Midwest when compared to direct competitors. Ferry flight preparation after long-time storage in Kingman / Arizona. The ferry flights went from Kingman via Myrtle Beach, Goose Bay and Iceland to Braunschweig/Germany.